While Amazon had already revealed prices for all three products in India and also started pre-orders a while back, they will only start shipping today and customers will no longer need to wait to get their hands on them if they place fresh orders. 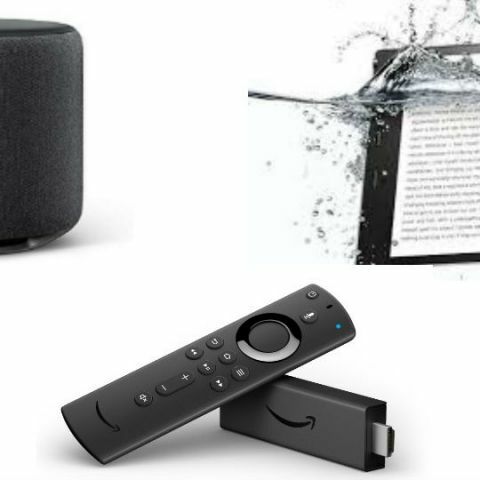 Amazon India has announced that it will start shipping the Fire TV Stick 4K with Alexa Voice Remote, Echo Sub, and the new waterproof Kindle Paperwhite in India starting today. The devices were all on pre-order up until now. The Fire TV Stick 4K costs Rs 5,999. The Echo Sub, essentially an Alexa-powered subwoofer, costs Rs 12,999. The new Kindle Paperwhite is priced at Rs 12,999. Amazon had announced all these devices in India during the months of September and October, but they will only start shipping today and customers will no longer need to wait to get their hands on them if they place fresh orders. The Echo Sub is a new entry into the Alexa-powered range of devices from Amazon. It is a wireless subwoofer with Alexa integration to receive voice commands. The Echo Sub can pair with any existing Echo speaker to provide a more powerful bass which is something Echo speaker users have been wanting for a while. Users can create a 1.1 or 2.1 stereo sound setup by pairing any Echo speakers with the new Echo Sub. The Echo Sub also gets an equalizer feature to adjust the bass, mids, and treble through voice commands. The Echo Sub is priced at Rs 12,999. You can read more about Amazon's upcoming Echo devices here. The Amazon Fire TV Stick 4K and the new Alexa Voice Remote can be purchased for a bundled price of Rs 5,999 in India. The Alexa Voice Remote features dedicated power, volume, and mute buttons and can also be purchased separately for Rs 1,999. As per Amazon, Fire TV Stick 4K is over 80 percent more powerful than “the best-selling” Fire TV Stick. It features a quad core processor clocked at 1.7GHz and it supports Dolby Vision and HDR10+, along with 4K UHD playback. With Alexa on Fire TV, customers can find, search and control movies, TV shows and apps with a press of a button on the remote. Users can pair Echo devices with the Fire TV for easy control of entertainment experiences using Alexa. Alexa on Fire TV, including far-field control, will also become available on all existing Fire TV devices in India via a software update slated to roll out starting November 14. The Alexa Voice Remote combines bluetooth and multi-directional infrared technology, and is powered by the company’s proprietary cloud-based service. The remote allows users to power on compatible TVs as well. Further, the Alexa Voice Remote is compatible with all Fire TV devices available in India and can control power and volume on thousands of TVs, Amazon claims. You can read more about the Fire TV Stick 4K here. The new Kindle Paperwhite features a soft, easy-to-grip back and is the thinnest and lightest Kindle Paperwhite yet, measuring 8.18mm thick and weighing 182g. The 6-inch display has a 300 ppi resolution. It also includes five LEDs and an adjustable front light for a glare-free display. It is designed to withstand accidental splashes in the rain, drops in the bathtub, hot tub, pool and beach. It is IPX8 rated and remains protected against immersion in up to two meters of water for up to 60 minutes. Amazon has introduced personalisation features in the new Kindle Paperwhite. There is an updated home screen which is claimed to make it easy for readers to find their next read. The suggestions come up based on a user’s reading history. Users can now save multiple reading settings, selecting the font, boldness level, and orientation settings. Users can also quickly switch between the main menu and the settings. The ebook reader is priced at Rs 12,999 for the 8GB Wi-Fi model and Rs 17,999 for the 32GB model with 4G. Only the 8GB model is shipping as of now, while the 32GB variant will be released in the coming months.